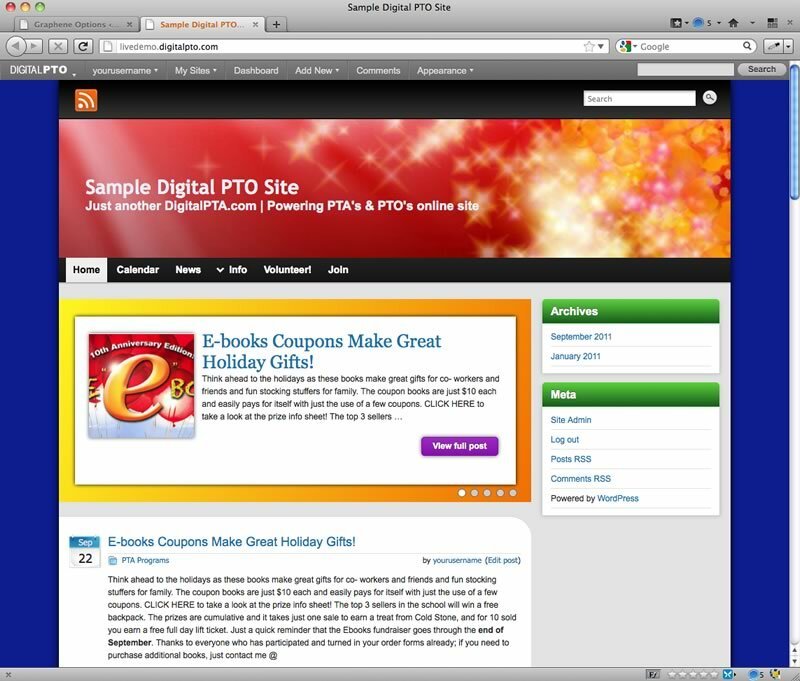 Home » New Features » A new theme has arrived at Digital PTO and it is amazing. Today we are excited to announce the release of our most advanced (and easy to use!) theme to date, the Graphene 2.0 theme. This new theme is available exclusively to our Premium Plan Members and it introduces an entirely new way to craft your website. The theme is extremely customizable. Here are a few highlights of some of the custom options. Change the background color to anything you want, with two clicks. Prefer to upload an image? No problem, it does that too. Custom news post slider on the home page. Let it pick your most recent content, or specify exact pages and posts to include. Change the colors on the widget/side bar as well as the background of the news slider, again, with just a few clicks. Automatic Child Pages. When you assign a page as a child page, this theme will automatically add a link to the child page (with description and image!) to the parent page. It’s incredibly simple! Custom Header Graphic. Pick one of the pre-built ones or upload your own! Full support for Business Advertising. If you are a Premium Plus Member, you now have the ability to place your community and business sponsor ads directly on your website and they will automatically revolve randomly as the page loads. There are 4 different locations for ads. Would you like to see a live version of this new theme? Visit MeiklejohnPTA.com to take a look. Below you will find a few quick examples of color variations on this new theme. Every color imaginable is available and at your fingertips. Here are a few examples that were created in just seconds with the Graphene 2.0 theme. We know that you are busy, so we have created a comprehensive training library based on the Graphene 2.0 theme that will walk you through every step of its creation and save you a ton of “learning” time. This is the most useful and comprehensive website training series ever created for PTA and PTO groups. Follow along as our founder, Matt Sampson, takes a brand new Digital PTO starter site and transforms it into one of the greatest PTA websites ever created. 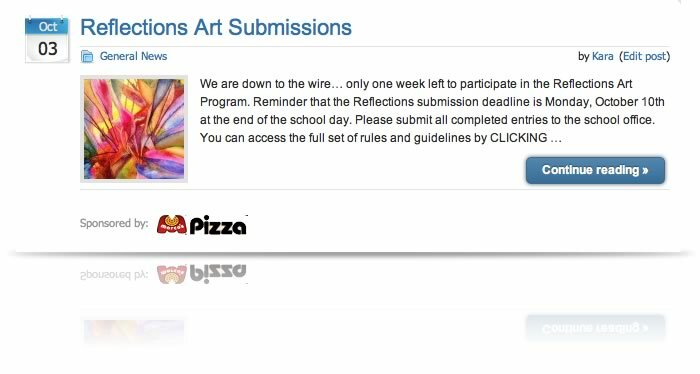 Watch Matt take his schools’ PTA website to the next level in simple step-by-step chapters that will cover everything from selecting and customizing your theme all the way up to integrating business sponsors and advertising. Filled with helpful ideas that not only cover HOW to use your website, but go deeper with the WHY’s that are so important when motivating volunteers, keeping your community informed and more. Access the training videos here! We hope you will find these training videos extremely helpful in creating your own PTA website. In addition to this new beautiful PTA website theme, we are also introducing two new features for our Premium Plus Members, the Events Calendar Pro and Business Sponsor Advertising. 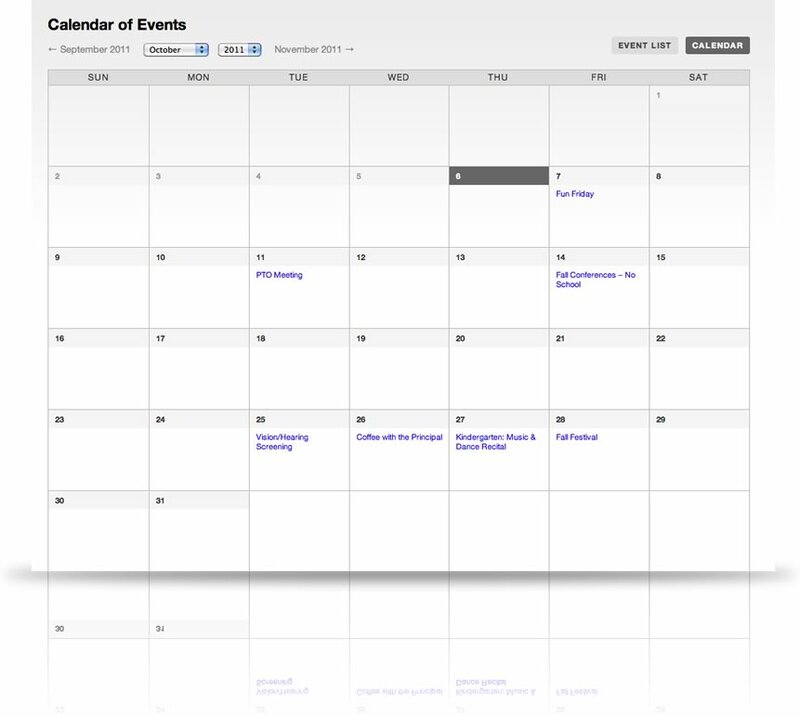 Our Premium Events Calendar Pro takes your calendar to a whole new level. With a beautiful design and clean presentation, this is the classiest PTA calendar you’ve ever seen. 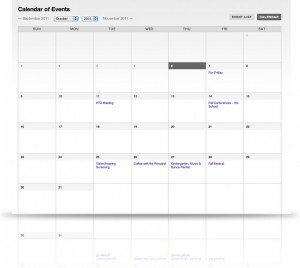 The plugin offers a calendar view, an upcoming events view, venue and organizer support, google maps, featured images and descriptions right on the calendar and more. The Events Calendar Pro also features a number of sidebar widgets that allow you to feature certain event categories, event lists, mini calendars and more. To top it all off, Apple users will be able to subscribe to the PTA calendar with one click and it will automatically be added to their Apple (or iPhone) calendar. This new calendar will be rolling out on new Premium Plans and any existing Premium Plans that would like to upgrade are requested to send us a quick email and we will take care of installing this calendar immediately for you. Business Sponsor Advertising allows you to make even more money. 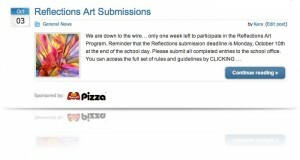 We have received numerous requests from parent groups about incorporating their own advertising into their websites. Ads for their local business partners, other organizations they support, etc. Today, we are please to announce that our Premium Plus members now have access to Business Sponsor Ads. The Ads module has been complete integrated with our new theme, Graphene 2.0. The ads work on all of our themes, but the Graphene 2.0 theme was built with these ads in mind. We offer 5 different locations to sell advertising including on the home page under every news summary, in the sidebar on every page, under full news posts, under full pages and also at the footer of your site at the very bottom. Each ad group can be combined as one or controlled with separate ad groups. We hope you like the changes. We’re excited to see what you can do with them. At Digital PTO, we spend every waking moment coming up with new and inventive ways to promote and enhance your Parent Group. We have been working on these new features for months based on our member feedback and our own ideas. We really hope you will like these new features that rolled out today. As usual, if you have any questions, please let us know!